Geopraevent has said that its avalanche radars have detected over 400 avalanches so far in this northern hemisphere this season, with heavy snowfall in the first half of January in particular causing many spontaneous and artificially triggered avalanches in the Alps. Since last winter, the Swiss company has installed several new systems worldwide. 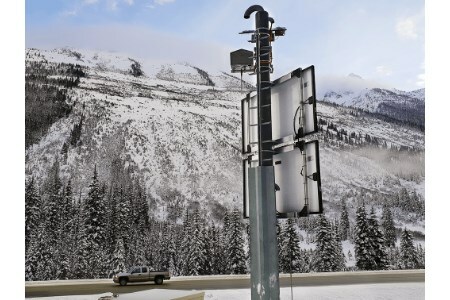 Their radars now detect avalanches on three continents: in Canada, a Geoprevent Avalanche Radar monitors a critical section of the Trans-Canada Highway at Rogers Pass – a project in collaboration with Wyssen Avalanche Control. Geopravenet’s first radar in the southern hemisphere monitors the access road to a mine in Chile, and in Switzerland, it has installed further avalanche radar systems in Belalp ski resort, the municipality of Quinto, and in the Engadine valley. The Belalp avalanche radar monitors several avalanche paths on the opposite slope and supports local safety managers in verifying avalanches, both spontaneous and artificially triggered. The avalanche slope at Belalp (ridge avalanche) is 3 km wide and ideal for a radar with 90° opening angle. This system further includes a people radar for automatic detection of skiers and snowshoe hikers on the avalanche slope. The radar tracks the people in this area and marks them on a map, assisting safety managers preparing an artificial avalanche.